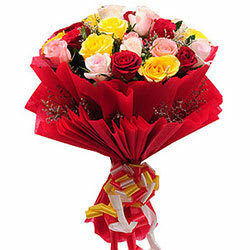 Deck the lives of the people closest to your heart with love by sending this Distinctive Power of Rose Bouquet that beautifully conveys the message of your heart to them. Our bestselling holiday arrangement is hand-designed with fragrant mix of 15 Mixed Roses nicely wrapped in a Tissue. Create special moments with this Designed Celebration Floral Bouquet when you are together with your loved ones. Weve decked out our bestselling Bouquet for the holidays Inspired by the beautiful Flowers like 24 Mixed Roses nicely packed in a Tissue.